Last week I decided to take time off from review books to read books that I hadn’t had a chance to read in 2011 and Across The Universe was one o those books. I immediately got sucked into this world on Godspeed I loved the idea of this whole world on a ship and someone being woken up after being cryogenically frozen for over 200 and some years. I will admit I didn’t really get attached to the MC or even the love interest like I do in some stories instead I was attached to the story and the ship. One of my friends had compared this book to the Outsider series by Maria V. Snyder and I think that’s what scared me from reading it sooner because I loved those books. Well I’m glad I finally read them! 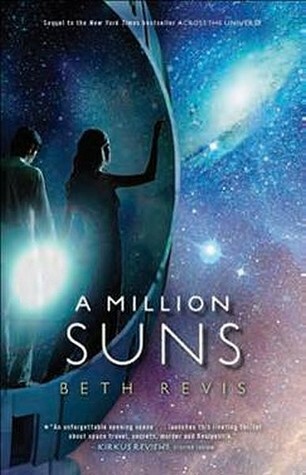 A Million Suns was even better than Across The Universe in my opinion and I actually grew to care more for the MC Amy and the love interest Elder. I loved the twists and turns in this story and the puzzles that Amy and Elder must figure out. Is Godspeed in trouble? Can they survive on this ship? What will happen now that there’s no Phydus to control the feeders? Can Elder lead? Al of these questions are answered and more. I can’t t reveal much as there would be a ton of spoilers but let me just say I cannot wait for the next installment in this series the ending was a whopper! Some people I thought I liked and trusted turned out to be evil and I ended up liking others that I didn’t think I would! I can’t wait for book 3!!!! I’ve never really looked at the back of a painting before. But now that I do, I notice a faint, almost invisible sketch made with a piece of charcoal or pencil from the looks of it. I squint, lean in closer, then pick the whole painting up and hold it up to the light. A small animal-this isn’t Harley’s sketching; his pictures were much more realistic. This cartoonish creature looks a little like a hamster, but with huge, exaggerated ears… a bunny. And beside it, a circle…or, rather, a flattened circle that’s more of an oval. In the center of the circle is a tiny square that looks like one of those super-thin memory cards Mom had for her fancy camera. It’s stuck to the canvas with something tacky, but when I slip my fingernail under the edge, it pops right off. I hold the object up on the tip of my index finger. Black plastic encases a thin gold strip of metal woven with silver threads of circuitry. What is this? It seems so familiar. I turn it over, but the other side is just hard plastic. And then it hits me-I have seen something like this before. I rust to my desk and pick up the small screen that showed Orion’s first video. Connected to a small port in the corner of the screen is an identical piece of square black plastic. The thing from the back of Harley’s painting is like a memory card… if I could figure out how to swap it with the one already there. I squint at the back of the painting again, hoping for some other clue. And there, just under the sketch, are tiny words, barely legible. “Curiouser and curiouser,” I say. Make sure to pre-order A Million Suns it comes out January 10th and trust me you’ll want to go on this long strange trip (sorry couldn’t help the Grateful dead refrence lol) with Amy and Elder! Get your copy here at Amazon, Barnes & Noble, and The Book Depository! And be sure to check out Beth’s awesome website! I need to read this book . I hate that I have to wait for the 3rd book, I don't want to!!! I loved this one as well, and I completely agree with you! I dont have that deep attachment to the characters. she could easily slip in a different character and I wouldn't care much. It's the ship, and space, all that jazz that I'm most interested in. That says a lot for the story though, because if I'm not fully invested in the characters, I don't normally like the book. I lose interest, but these.. couldn't put them down. I loved this book and love this series. It's a great young adult series that has a hint of romance, but not enough to interfere with the story. I could not put my kindle down and finished this book in under 24 hours.